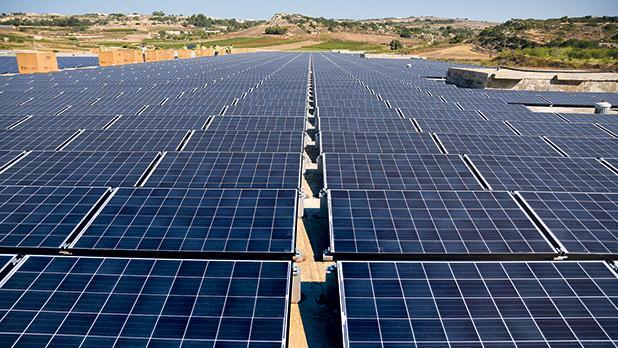 Malta will increase its focus on solar energy under a new 2030 plan though development policies and lack of available land could hamper the shift. The draft National Energy and Climate Plan, newly published for public consultation, lays out the government’s strategy for the next decade under the EU’s long-term climate goals and Paris Agreement commitments. It lays out key objectives for Malta of a 19% reduction in greenhouse gas emissions and a 13% share of renewable energy in final energy consumption by 2030. Building on a move towards solar energy generation in the current renewable energy plan, the draft document includes extensions on measures to incentivise large-scale solar farms and rooftop photovoltaic panels. It suggests that solar output could reach a 260 megawatt peak by 2030 – implying a total footprint of about 3.4 square kilometres – compared to a planned 160 megawatts and a 2.7 square-kilometre footprint in 2020. This would contribute to between 30 and 40% of Malta’s renewable energy contribution while heating and cooling – primarily heat pumps – will contribute 40 to 54%. Waste-to-energy electricity generation from the major incinerator planned to be completed by 2023 is expected to contribute only “a relatively small share”. Prioritisation of PV systems, however, could, according to the plan, be hampered by the rapid decrease in the land available for solar farm developments, pushing up costs. Moreover, planning policies encouraging the development of apartment blocks pose further problems both because of the reduction of available roof space and also by the increase in overshadowing. The plan warns that interest in investment in renewable energy appears to be waning, with real estate investment being prioritised due to its shorter payback period and perceived longer-term benefits. It points to the low take-up on the government’s second competitive call for large-scale solar installations, where the total bids amounted to just half of the capacity on offer. The plan proposes discussions with banks to include incentives for the installation of PVs and solar water heaters in loan policies, as well as incentive schemes for developers and real estate agents. It also proposes building on the government’s communal photovoltaic farm project at the site Il-Fiddien, allowing people without access to a private roof to buy into the shift. Also stressed is the importance of solar water heaters, with the government aiming to provide support for the installation of 1,500 systems every year in the next decade ‒ compared to 400 a year under previous plans ‒ although it notes that the past few years have seen a downward trend in such systems as preferences move to PV panels. The draft plan does not include any assessment of the impact the planned policies and measures are projected to have, stating only that this analysis will be included in the final plan that must be submitted to the European Commission by the end of the year. The plan, which is open to public consultation until April 10, also includes the government’s 2030 measures on energy security, internal energy market, energy efficiency and research, innovation and competitiveness.